Updates on Isaac usually include a medical vocabulary lesson. I like learning the lingo; here are some fun ones. Bands- levels of young white blood cells in a CBC (complete blood count) that could indicate infection. As wikipedia explains, white blood cells that have just been released from the bone marrow look like bands, hence the name. These are looked at separately, and in addition to the white blood cell count. Even if the WBC is normal, an elevated level of bands could mean an infection. PICC line- I had heard of this one when I was in Antepartum, a peripherally inserted central catheter is like a heavy duty IV. It is inserted in the arm (like an IV) but goes all the way to the superior vena cava next to the heart. PICC lines last longer than IVs, so it means less pricks for Isaac and can also be used when the medicines given intravenously could be too irritating to the skin and smaller blood vessels. Apnea, Bradycardia, Tachypnea, Desaturations - respectively, not breathing, heart rate dropping, breathing fast, and low oxygen levels in the blood stream, all terms you've probably heard thrown around on medical dramas I'm sure, and all very common for preemies. 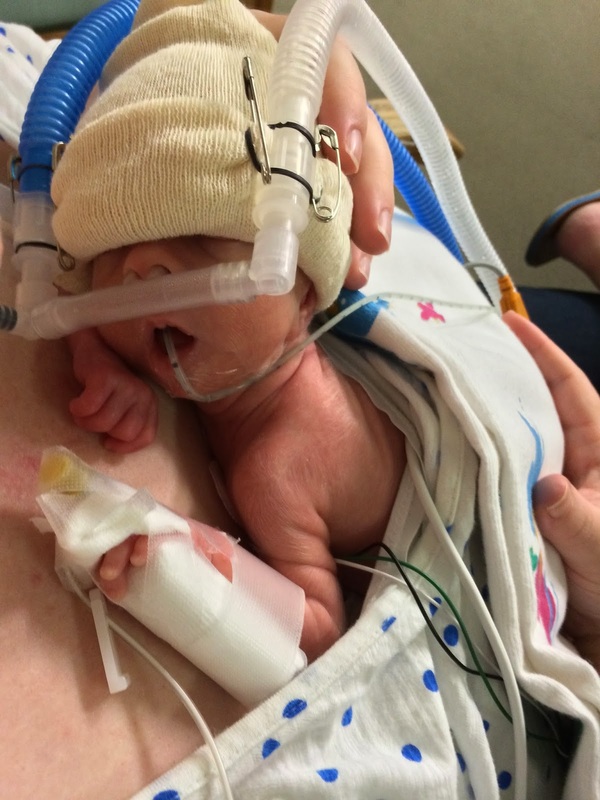 Like all preemies, Isaac has had his ups and down. His first big hurdle seems to be learning to tolerate breast milk well, something that technically, he shouldn't be doing anyway. Since, you know, he should be gestating. The nurses use a syringe to feed him via an og tube. At first, babies only are given a tiny amount of milk, around 1/2 tsp every 3 hours. As they tolerate it, each day they increase the amount. If a baby isn't digesting milk well, his belly will get swollen and a KUB (see above) will show air in the intestines. When that happens, the feedings stop until the baby can recover. Doctors run tests to rule out infections or any other more serious complications, and we start all over again. His first go round, Isaac made it all the way up to full feeds, which for him, was 20 ml, before he started to show signs of intolerance. So they stopped his feeds, and when they started them up the second time, he made it up to 8 ml when his belly started to get swollen. They restarted his feeds 2 days ago. Since he's had such a hard time with it thus far, at first, they would only give him about 1/4 tsp at a time. As of last night he had worked his way up to 4 ml, which is almost 1 tsp. Hopefully, the third time is the charm. While Isaac is working on getting up to a volume that would count as a "full feed," (determined based on weight) he is also being given nutrients via a PICC line. One of Isaac's IV bags, called TPN, looks like neon yellow gatorade and is full of sugars, vitamins, amino acids, and electrolytes, so really, it kind of is gatorade, very expensive, tailor-made for him, gatorade. His other IV bag is straight-up lipids. It looks like crisco, and I have no idea how they get that to flow through an IV line, but I like to imagine that it's bacon fat. Is that gross? What ever it is, it's working; he has almost gained a full pound! And as of last Sunday, grown 2 inches. That puts him at 3 lbs. 3 oz. 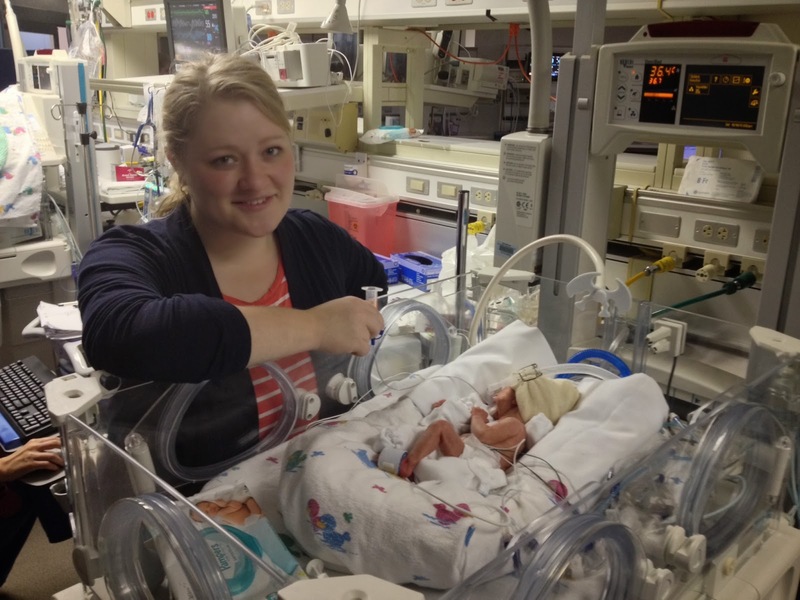 and 15.75"
The NICU is a curious blend of attachment parenting and high tech equipment. For all their love of gadgets, and monitors, the doctors and nurses are also huge fans of breastfeeding and skin-to-skin holding. Those two things are the best ways we (as parents) can do something to help Isaac. Preemies who are given breast milk rather than formula from the beginning are at much lower risk for some of the more severe, though common (and treatable!) complications of prematurity. 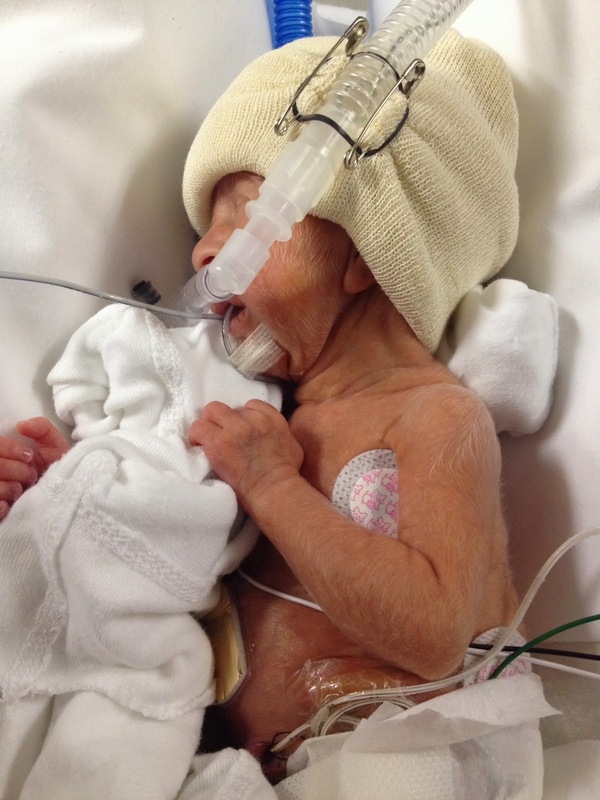 Preemies given lots of skin to skin contact usually maintain their body temperature better (very important for when the time to go home is getting closer). They also encourage you to talk to your baby as much as possible. 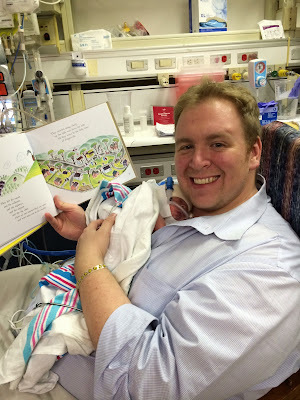 In the evenings, Mark will read to Isaac, and I throw in a lullaby or two. Here, Mark is reading Isaac Mike Mulligan and His Steam Shovel. This was a classic for both our families growing up, but in Texas, if you don't start kids on this story early it's completely over their heads. I read it to my first grade class years ago and they just didn't get it. Most of them had never even heard of a basement, let alone a cellar, and since the heat only gets turned on about 3 months out of the year, the need for a furnace didn't make much sense. Why should they care about digging the Town Hall cellar in one day? Why is it a good idea to turn Mary Anne into the Town Hall's furnace? The entire pathos of the story was totally lost on them. Thus far, the support we have received has been wonderful, but I still think this article is very helpful. When friends and acquaintances are experiencing a crisis, illness, or even just a rough go of it, we can be at a loss for words, and the words we do say come out all wrong. Ring theory is the cure for that. Read it, you won't be sorry, I promise! And yes, I did already post it on facebook, so you might have already seen it there. And my second favorite, which I've had on my iPod all along, is Wilco's My Darling. This one really is meant to be a lullaby. The lyrics are just so full of love and family, without being saccharine or sing-songy. Anyone who's ever been a NICU parent, and held their baby while the apnea monitor dings yet again, will especially appreciate the line about breathing. Again, in case you don't click through, the song is short enough that here are the lyrics in full. Look who had his eyes open last night! And now that this is all typed up, I realize it's entirely too long to be called "Quick Takes", but what're ya gonna do? What you should do is go see Jen for more! What a handsome little CHAMPION! And, what wonderful parents he has! The picture of Mark reading him Mike Mulligan really got to me, as that's the first book Kyle read to Will in the NICU. Dear Anne!! Know that you've got lots of prayer warriors. Our Maeve refuses to pray for anyone or anything but Baby Bazin and Baby Caroline! So glad you are updating! Congrats on Isaac gaining a whole pound!! That is exciting! Just stopped over from Jen's blog. I'll be praying for you. And- I'll take your advice on Mike Mulligan and pick it up at the library for my three-year-old before it's too late! LOVE LOVE LOVE reading your updates and seeing new pics of the baby. I can't wait to snuggle him! So great to see an update and hear that he's growing so well. LOVE the last picture - he's looking right at the camera. So precious. Praying for Isaac and all of his needs as well as for you and your husband. I LOVE the pic of Isaac sleeping with his mouth wide open. I'm so looking forward to coming to meet him! Former NICU mom here as well. I am so glad that your hospital is supportive of breastfeeding and kangaroo care; I think it makes parenting a NICU baby better (if it really can be that). Pick the books and songs that mean something to you rather than worrying about the "appropriateness" of them. We did a lot of Mumford and Sons with our guy...Many prayers! Recent NICU Mom here! Hugs and prayers for you, baby, and hubby. One of the most amazing things to me about NICU care is how much they involve parents. Hang in there Mama, you all are doing AMAZING! high-risk pregnancies, encourage expectant mothers to educate themselves before electing cesarean deliveries, provide families of premature babies a realistic look at what lies ahead in their NICU journey, and show that miracles can happen, and hope can turn into joy. I couldn't help but tear up to see you and Mark holding your sweet little boy. Hope you guys are hanging in there and that Isaac keeps growing and fighting! He's gained a pound already? That's awesome! Good for you for breastfeeding/pumping, it's so not fun when it's all pumping, but hopefully will be worth it in the end when he's able to breastfeed for realsies. Continued prayers for your whole family, Anne!